But a year ago, Jerry’s future wasn’t so clear. Even though he studied ICT and even took classes at the prestigious Instituto Tecnológico de Santo Domingo in the Dominican Republic, he was doing odd jobs to support himself and his family and his hopes for an ICT career were dim. Then, on January 12, 2010, the earthquake hit. Jerry was in Port-au-Prince at the time, and like many others, his house was damaged and Jerry was rendered homeless, and was forced to live at a friend’s. He was still taking whatever jobs he could find, and one of those positions – as a driver with Save the Children – led him to Inveneo. For Inveneo, Jerry is the first of what we believe will be many Haitian success stories. He’s now employed in his chosen profession, and the technologies he’s helping deploy are expanding opportunity throughout the country, beyond Port-au-Prince. Inveneo is committed to bringing real opportunity to Haiti in 2011 through the rural broadband connectivity program Inveneo is deploying in partnership with local Internet Service Providers (ISPs) and Haitian entrepreneurs. This program is supported by an innovative collective of organizations whose focus is ICT entrepreneurial capacity building, rural economic development, and education through ICTs, including the Clinton Bush Haiti Fund, Craigslist Charitable Fund , The EKTA Foundation, Google, Microsoft, NetHope and the USAID Global Broadband and Innovations Alliance. The net effect of our efforts will be broadband Internet connectivity that stimulates economic growth and supports decentralization of the Haitian economy. In the process, we are confident that we will see the formation of many Jerrys! San Francisco, CA – January 3, 2011 Inveneo, a non-profit social enterprise dedicated to connecting and empowering rural and underserved communities with information and communications technologies (ICTs) in the developing world, announced today that Google has awarded it $182,000 toward its work in Haiti. This funding will go specifically to develop, document and implement a model of local network ownership and operations for the rural broadband connectivity program Inveneo is deploying in partnership with local Internet Service Providers (ISPs) and Haitian entrepreneurs. This connectivity program is supported by an innovative collective of organizations whose focus is ICT entrepreneurial capacity building, and rural economic development and education through ICTs. This collective includes the USAID Global Broadband and Innovations Alliance, NetHope, the Clinton Bush Haiti Fund, The EKTA Foundation and Microsoft. Google’s award will fund the development and implementation of a locally owned operating model for the high-speed, rural broadband wireless connectivity that will be deployed in 20 regional/rural population centers across Haiti, currently not served by local ISPs. This grant is essential for Inveneo to build a model that will enable local ownership and fair use of the network so that ISPs can reach and serve clients (schools, NGOs, enterprises and others) cost effectively. The rural broadband program, which is designed to be financially sustainable, will deliver affordable Internet services to a range of organizations. The connectivity will enable these organizations to accelerate Haiti’s rebuilding and better position the rural areas for economic development and improved access to opportunity. Inveneo is a U.S.-based social enterprise whose mission is connecting and empowering rural and underserved communities with information and communications technologies. Inveneo’s model of nurturing and supporting local talent to support technical systems and earn income has been successfully implemented around the world. Since 2006, Inveneo and its partners have delivered innovative solutions to more than 1,500,000 people in over 500 communities in 25 countries in Sub-Saharan Africa, South Asia and Haiti. December 7, 2010 – WASHINGTON, DC – The Clinton Bush Haiti Fund today announced a grant of $742,688 to Inveneo, a nonprofit social enterprise. The funding will accelerate the development of a wireless broadband Internet network in six rural regions across Haiti. In addition to enabling rural communities with high-speed connections, Inveneo will provide Internet connectivity that will stimulate economic growth and support decentralization of the economy. Within 18 months, management and responsibility for the network will be turned over to local Haitian partners. The project, developed in collaboration with Microsoft and The EKTA Foundation, will deploy a high-speed, broadband wireless network in 20 rural population centers and provide technology for 40 schools throughout Haiti. The Clinton Bush Haiti Fund grant will also support training programs for Haitian Information and Communication Technology (ICT) entrepreneurs. Increased network capacity will give ICT entrepreneurs the opportunity to serve a variety of clientele and to build up the local IT sector. Haitian IT specialists will have the opportunity to hone their expertise, preparing them to help their nation build back better. Inveneo’s program is bringing connectivity to formerly isolated communities through an innovative coalition of organizations that include Haitian-owned Internet Services Providers, NetHope, the USAID Global Broadband and Innovations Alliance and many other organizations and donors. “The power of this program is that in addition to enabling rural communities with high-speed connections, we are also providing Internet connectivity that can be resold to Haitian Internet cafes, community organizations and other businesses, stimulating economic growth. Just as important, turning over networks to Haitian ISPs and training Haitian technicians will lay the building blocks for Haitians to own and grow these services,” according to Gary Edson, CEO of the Clinton Bush Haiti Fund. “We are grateful to the Clinton Bush Haiti Fund for this grant. Though our work in Africa and Asia, we have seen that developing local capacity to manage and own in-country information and communications technologies is a key driver of economic growth. The investment in Inveneo’s network helps us deliver this key economic driver to rural parts of Haiti exactly when they need it most,” said Kristin Peterson, Co-Founder and CEO of Inveneo. Inveneo’s work will build on its efforts immediately following Haiti’s devastating earthquake when Inveneo wirelessly connected many members of NetHope, a consortium of major international NGOs. 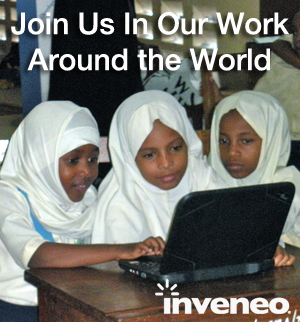 Several weeks later, Inveneo had ultimately connected 18 NGO offices in 35 locations by partnering with technology organizations on the ground, such as Haitian ISPs Multilink and Access Haiti. After a few months of operation, Inveneo turned this network over to the Haitian Technology Group, a local firm trained by Inveneo engineers and dedicated to providing quality IT services to the Haitian market. Inveneo is a nonprofit social enterprise whose mission is connecting and empowering rural and underserved communities with information and communications technologies. Inveneo’s model of nurturing and supporting local talent to support technical systems has been successfully implemented around the world. Since 2006, Inveneo and its partners have delivered innovative solutions to more than 1,500,000 people in over 500 communities in 25 countries in Sub-Saharan Africa and South Asia. Their Haiti program is an accelerated version of this model, as demand for the broadband service to-date has outpaced the supply of local IT experts. The Clinton Bush Haiti Fund is a 501(c)(3) nonprofit organization founded after Haiti’s January 12, 2010 earthquake, when President Barack Obama asked former Presidents Bill Clinton and George W. Bush to lead a major fundraising effort to assist the Haitian people to “build back better.” The Clinton Bush Haiti Fund initially responded to the catastrophe with millions in humanitarian relief. By the time the Fund was officially formed in May 2010, it transitioned to primarily serving its longer-term mission of sustainable reconstruction efforts designed to promote jobs and economic opportunity, empowering Haiti to chart its own successful future.